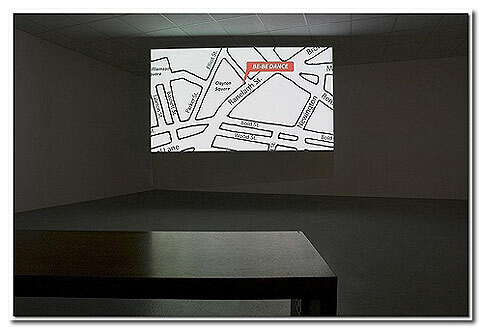 Tsui Kuang-Yu's DVD projection, Liverpool Top 9!, focuses on the mundane aspects of the city and the absurd and often counter-productive urban design solutions habitually instigated by town planners. By positing new potential uses for key sites throughout the city, Kuang-Yu suggests that we can intervene on and transgress the way in which our experience of the city is dictated by an array of rules, customs, signs, and symbols if we change and adapt our established behaviors. Again, however, the fact that this is a DVD projection somewhat undermines the work's subversive potential. Doesn't the fact that it is DVD mean that the work is representing how our experience of place is produced through signs, symbols and conventions rather than really intervening in how we navigate the city? However, in contrast to the more anthropological, interpretive works that were on view at International 06, what is interesting about these projects is that they seek to inspire some form of active co-collaboration and engagement with the viewer/co-participants whereby the works are co-produced. They attempt to activate the creation of new dynamics and not to merely represent and/or reveal existing ones. Pica and Kuang-Yu are not professing to have access to some special knowledge about the Liverpool that they can then disclose to us, they are inviting us to become involved in the creation of a new reality, to intervene in pre-existing processes and to re-make the city. Another project that seemed to more closely approximate a model of collusion was Mario Navarro's installation Two Rooms, located in Liverpool's Central Library's large circular Picton Reading Room. Reflecting the artists' interest in the creation of micro-communication spaces that undermine the rigid and monolithic forms of Chilean behavior in contemporary society, especially of it unalterable project of modernity, Navarro produced a temporary opaque red room that is a replica of a large room in Chile built in the 1990s to showcase modern technology. He intervened on the narratives of unquestioned technological progress by inviting nine people suffering from brain injuries to hand-customize a series of chairs that reflect their own individual biographies. Although Two Rooms refers to the Operations Room at the heart of "Project Cybersyn" -a short-lived attempt in the early 1970s, involving Liverpool University researcher Stafford Beer, to use cybernetics to create a hyper-efficient society in Chile, Navarro did not attempt to describe or represent Liverpool to us. Rather by engaging a group of co-participants in a joint exploration of modern technological progress, he draws out subtle points of relationality between the context that is familiar to him: Chile, and the context in which he is temporarily working. We could also perhaps argue that one of the most engaging commissioned works in International 06 did not respond to the context of Liverpool in the slightest. Teresa Margolles work Fluidos installed in the Tate Liverpool builds on an already existing impressive body of work that deals with the social body after death. Rather than being the great leveler, Margolles posits that death, and particularly what happens to people after they die, is as much determined by socio-economic factors as how people live. Fluidos draws on the minimalist aesthetic but re-introduces the body as corpse. Drops of water that was used to wash the bodies of murdered people in Mexico City after their autopsy fall from above onto a hotplate. The hiss of the water droplets as they hit the heating element conjures up the tangible and searing pain of loss. We could argue that Margolles' exploration of the more universal themes of death and loss was much more poignant than many of the works that sought to uncover the "reality" of "Liverpool." A significant number of new context sensitive commissions for International 06 were located in the public realm, which posits the question: what kind of conception of place/site did the curators of International 06 articulate in "situating" contextual works in the city of Liverpool?